Yup, we know how it sounds. But this one’s big. And with so much life at stake RIGHT NOW, we refuse to sugarcoat what YOU need to know. Allow us to explain. But as is so often the case, they glossed past the real news — revelations that, given their catastrophic potential, are of a magnitude far beyond any oil spill disaster and *should be* on par with the imminent collision of a massive asteroid, an actual alien invasion, or the breakout of nuclear war. EVERYTHING that eats ANYTHING exists because of phytoplankton in the global ocean. They are THE BASE LIFE OF ALL LIFE. Half of all organic matter on our planet. The primary absorbers of CO2 (heat-trapping gas) from the atmosphere. Create every 2nd breath of oxygen we breathe. Well, a shocking new study has concluded that phytoplankton have ALREADY DECLINED (DIED- OFF) BY 40% SINCE 1950 (most notably in the northern hemisphere) and continue to do so at an accelerating rate — ABOUT 1% PER YEAR(!) — because of the heating impacts of global warming. At present, the world’s atmosphere is on an accelerating course to reach a state of potentially unsurvivable, runaway global heating and climate breakdown extremes DURING THE LIVES OF TODAY’S CHILDREN and only EMERGENCY international action at EMERGENCY (world-war time) speed *may be* proportional enough to confront the scale, scope and urgency of this unprecedented threat. 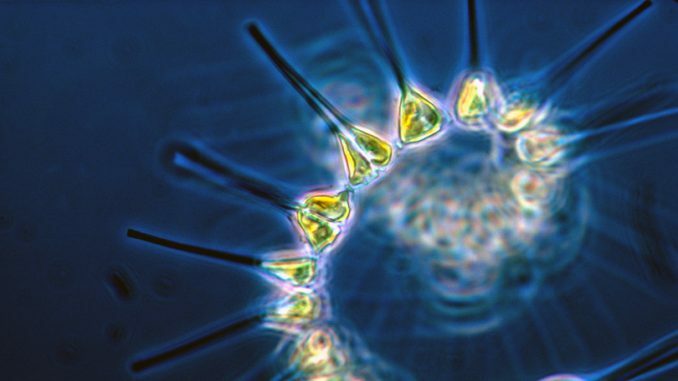 “Phytoplankton is the fuel on which marine ecosystems run. A decline of phytoplankton affects everything up the food chain, including humans,” Dr Boyce said. NASA – What are phytoplankton?